Sun-dried tomatoes at home? Easily! At the height of the season of tomatoes, in the late summer or early autumn, all face the problem of disposing of the crop. If you are bored with the endless lecho or banal "in its own juice", I offer to cook dried tomatoes. Tasty, elegant, festive. In general, who tried (and is unlikely to remain indifferent), he will understand! Well, if you did not try - it's time :)! With what and how to eat them, you ask? Oh, there's plenty of variations. Classics of the genre - this, of course, bruschetta with sun dried tomatoes. Complement her favorite cheese or canned tuna, but you can just greens, olives, rings of sweet onion and olive oil - and a real Mediterranean delicacy is ready! Well and further - it is your imagination and taste. Paste, risotto (And indeed all the cereals) pesto, Salads, quiches, pizza and cakes - use sun-dried tomatoes, which you wish to complement their usual meals and giving a seemingly everyday tastes of a new sound. Sun-dried tomatoes can be served as snacks as a separate dish, or, say, a cheese plate, combine the olives, nuts, use them for the preparation of canapés and serve wine. In a word, how would you have not filed their will 100% tasty and impressive! vegetable oil (preferably olive) - 0,5-1 glass (depends on the number of tomatoes in the bank). 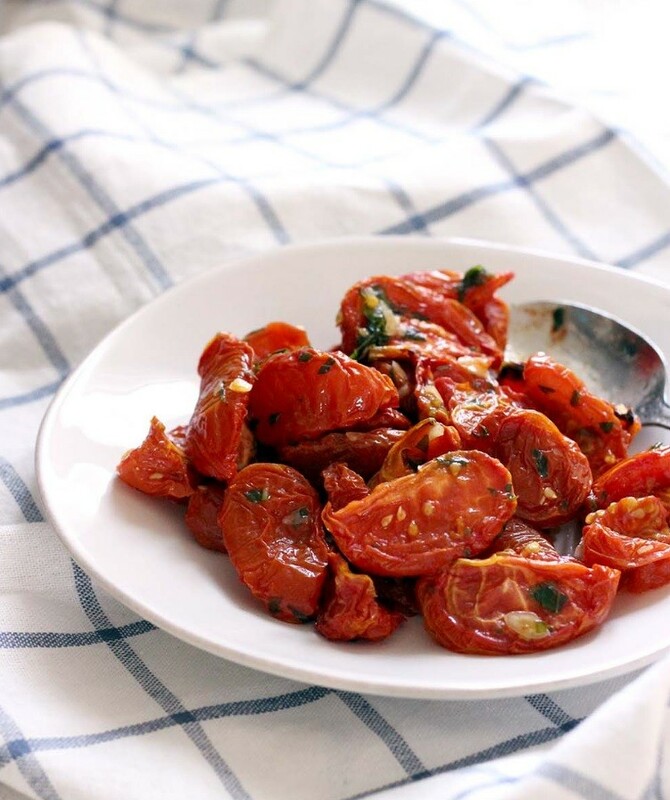 *Choose meaty tomato varieties with intense flavor (not that where a lot of juice). Sami tomatoes advise to take small. Wash tomatoes, dry them on a towel. Cut each on 2, 4 or 6 parts. Baking tray lay a parchment, lightly grease it with vegetable oil. Lay the slices of tomato as close as possible to each other. Salt the tomatoes, sprinkle with all the spices. Garlic cut into slices and spread them evenly over the tomatoes. Put in a preheated 120 degree oven (mode - convection) and jerk 3,5-4,5 hours (depending on the lobules / tomato varieties size / your oven). After remove the pan, cool slightly and tightly put slices of tomatoes in a glass jar with layers of fresh garlic. Pour pieces dried tomato butter (delicious with olive Extra Virgin). Totally cool and storing it in the refrigerator (up to 6 months).